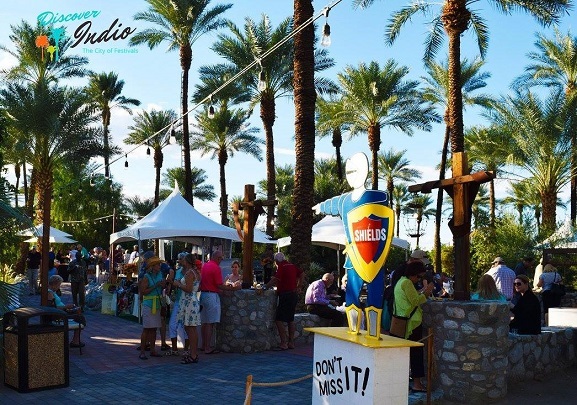 INDIO, CA (October 14, 2016) – The Greater Coachella Valley Chamber of Commerce in partnership with the City of Indio and the Indio Visitors Bureau is proud to host the Third Annual Taste of East Valley. The event will be held at Shields Date Garden on October 27th, 2016. Register here. The Bistro at Fantasy Springs Resort Casino: The Bistro specializes in exciting, contemporary fine cuisine including succulent seafood and tantalizing sushi selections. You’ll also enjoy carefully dry-aged on site, hand-carved, premium USDA beef. The Bistro offers an enticing array of salads, appetizers, entrees and desserts. The Café at Shields Date Garden: Description: The Cafe at Shields Date Garden offers breakfast, lunch and dinner, specializing in traditional American and Mexican dishes. The majority of The Cafe’s seating is on the outdoor patio boasting fresh white umbrellas, ivory linen covered tables, our rose garden, date palms and mountain views. California Ocean Grill Kitchen: At California Ocean Grill, we strive to serve the freshest seafood in the desert in a fast, casual setting. Our clean interior and collection of unique greenery offer the perfect, relaxing atmosphere to share a meal and drinks with friends and family. From the classic fish and chips to our Coronado Trio Sliders, our dishes are made with a conscious desire to provide fresh, sustainable foods to the desert. Cie Sichuan Cuisine: CIE Sichuan Cuisine, is traditional Chinese food from Sichuan Province, in China. Sichuan Province is the most famous Province in China for their flavorful food. True Chinese Cuisine at its finest. Ciro’s Italian Restaurant: “Where the locals eat!” For generations families have come to Ciro’s and looked through the window into the kitchen as their pizzas were made. Almost 50 years after it opened Ciro’s is still serving up traditional Italian recipes to the valley. Costco Wholesale: Costco is known for carrying top-quality national and regional brands, with 100% satisfaction on guaranteed to our members, at prices consistently below other retailers. CV Rescue Mission Catering: Mission Catering benefits the Coachella Valley Rescue Mission. Our trained chefs under the auspices of the CVRM prepare for your event a wide variety of gourmet and popular boards of fare tailored to your desires. From sumptuous banquets to elegant dinners to hearty BBQ, we will make your event the talk of the town. All proceeds go towards feeding and housing “the least, the last and the lost”, providing over 18,000 meals a month to hungry men, women and children of the Coachella Valley as well as sheltering 150+ people and providing job training and counseling. Dunkin’ Donuts: Dunkin’ Donuts is the world’s leading baked goods and coffee chain, serving more than 3 million customers per day. Dunkin’ Donuts sells 52 varieties of donuts and more than a dozen coffee beverages as well as an array of bagels, breakfast sandwiches and other baked goods. El Ranchito Restaurant: Our take on Michoacan style Mexican food. Family owned business for 27 years, in the heart of village of old town. We have the best carnitas in town! Jimmy John’s Gourmet Sandwiches: We serve from-scratch food made with excellent ingredients. At Jimmy John’s our food is simple; it’s clean, and it’s fresh! We use locally purchased produce, which is brought in fresh and hand sliced daily. Our tuna salad is made from scratch by hand. Our real provolone cheese, oven-roasted turkey, choice top round roast beef, hickory-smoked ham, or dry cured genoa salami and spicy capicola, are also brought in fresh and sliced by hand daily in every Jimmy John’s location. Mario’s Italian Café: Mario Del Guidice (A’ Ciao), the founder of Mario’s Italian Cafés, started his career in Brooklyn and Queens, New York, back in 1961. He moved his family to the valley in 1972 and for the past 41 years hase been delighting residents with the old-world family recipes. Come enjoy his award-winning restaurant in Indio with Vicki & David. Mimi’s Café: Different tastes and textures all coming together in one delectable forkful of flavor. Dishes with this sort of perfection are what we strive for and you will find at Mimis Café. Pizza Factory La Quinta: We’re proud to serve you delicious calzones, ooey gooey pasta, and of course, piping–hot pizzas. Since we made our first pie, we’ve used only the freshest ingredients around. But we wouldn’t be Pizza Factory without hungry customers like you. So sit down, grab a slice (or two, or three), and dig in. RosAmarillo’s Restaurant: RosAmarillo’s blends integral Mexican attributes with a progressive technique of cooking to create unique and flavorful dishes. SIP Coffee House & Juice Bar: The aroma of fresh coffee fills the air in this friendly neighborhood coffee house and juice bar. Family owned and operated, it’s the perfect stop to spend time with friends and enjoy a freshly brewed coffee, juice drink or pastry. Title Sponsor: Smart & Final: Smart & Final is the smaller faster warehouse store where busy households find great savings on food, supplies and culinary equipment. We have everything you need for cooking, entertaining and cleaning-up afterwards. Last year 18 restaurants took part in the event, serving up sample dishes for the sold out crowd of 400 attendees. The cost of admission is $20 and includes samples from every restaurant in attendance. The evening will include live music, art, and entertainment. Maximum attendance is 400, those wishing to attend should book their tickets online. Taste of East Valley is presented by our Title Sponsor Smart & Final. Shields Date Garden is located at 80-225 U.S. Highway 111 in Indio. For additional information on Taste of East Valley please visit www.CVDining.com or call 760.347.0676. To reserve your tickets visit Eventbrite.